As of this morning, Saturday September 5th, the Station Fire in the San Gabriel Mountains, which claimed the lives of two firefighters, is 49% contained. The fire has burned over 154,000 acres. That's over 240 square miles. 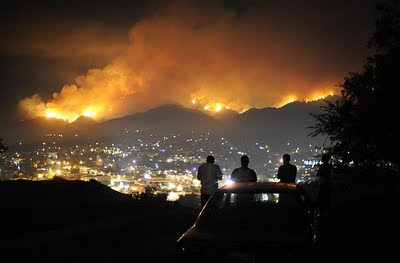 In terms of area, it is the largest fire in the recorded history Los Angeles County. The huge thunderheads (pictured above) are more than smoke. The intensity of the heat from the fire creates its own micro-climate which causes these clouds to form above the fire. They actually have their own name: pyrocumulus. The communities affected by the fire (La Cresenta, La Canada, Flintridge, Pasadena, Altadena, San Marino, Monrovia) are a full thirty-five miles away from where I live. 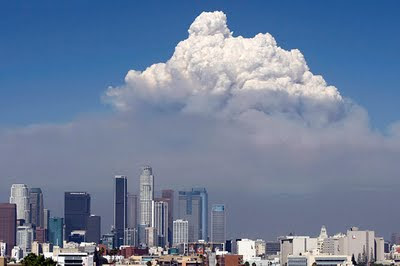 Aside from smokey skies and the large plums of smoke, my information about the fire has been limited to the Los Angeles Times. The San Gabriels stretch seventy miles from east to west, and twenty five miles from north to south. Most peaks are between 6,000-8,000 feet high, and are the picturesque snow capped mountains behind L.A. during winter months. 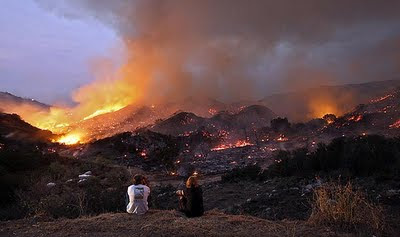 The mountainsides are very steep, making fighting the fire extremely difficult.